After a full day at Sea World the day before, it was wonderful to have a No-Real-Plan-Day on Saturday. We slept late (Can I please get an amen for heavy hotel curtains? I big, fat, puffy heart LOVE them), took our time getting ready then drove into downtown San Antonio. We went to the Market area first. It was so festive and relaxed. Oh, and hot. for a yummy Tex-Mex lunch. We sat on the patio, which was made more bearable by misting fans, so we could listen to music and of course, people watch (one of my favorite pastimes). I was shocked by the amount of denim I saw people wearing (this was also true at Sea World--can you imagine soaked, sweaty denim?!?!). It's July folks, in Texas, put the denim away for a while. After lunch we bought a few treats from the bakery and headed closer to the Alamo (in the comfort of our A/C car of course). Being a native Texan and a former 4th grade teacher that fully embraced teaching Texas History, I figured it's never too early to plant a few historical seeds with Annelise. I told her a little bit about the Texas Revolution, the evilness that was General Santa Anna and the glory of William B. Travis and the soldiers at the Alamo. Then we watched the IMAX movie, Alamo: The Price of Freedom. She paid attention through the whole thing and asked questions here and there. It warmed my heart. After seeing the IMAX movie we wandered over to see the actual Alamo. It never ceases to shock me when I see this piece of history surrounded by so much modernization, commercialization and urban sprawl. William B. Travis is turning in his grave (well, he would be if he had one I'm sure). It was, of course, a busy place, with never ending scores of people queuing up to venture inside. Notice the denim? I was not kidding. I was worried they were going to have a heatstroke. We paused for a family picture. Then took the cooler approach to visiting The Alamo*. Snowcones in the shade. Perfect. We briefly considered going down to the river, but it was scorching hot with little breeze so we opted to go back to the hotel. I know, we're cowards. 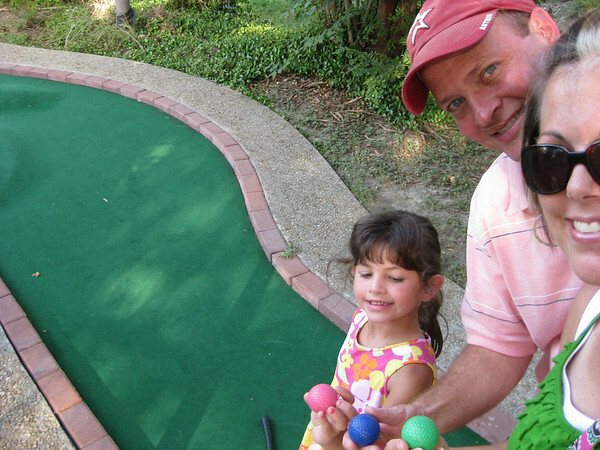 After a little down time (there may have even been napping) we headed out for a round of miniature golf. I was hoping it would be one of those cutesy golf places with charming windmills and interesting putting challenges. It wasn't, but it was still fun. We managed to fit in supper and another round of fun at the hotel pool before calling it a night. It might seem like we didn't do a whole lot, that's probably true. I'm a fan of a light itinerary, it helps keep the insanity (which is always bubbling close to the surface) at bay. We were surprised to learn our Sea World passes were actually good for two days, even days later in the season. Score! We briefly considered returning on Saturday to do the Lost Lagoon area and hit anything we missed, but then got a hold of our senses and let that urge pass. I actually shouted, "Praise the Lord we are NOT going to Sea World today!" as we drove by the traffic jam of over a mile of cars waiting to get into the park on our way into downtown. Shiver. I saw enough inappropriate attire, way too many boomzooms, bellies and bottoms to last me quite a while. And we didn't step a toe into the Lost Lagoon water park. Shudder. 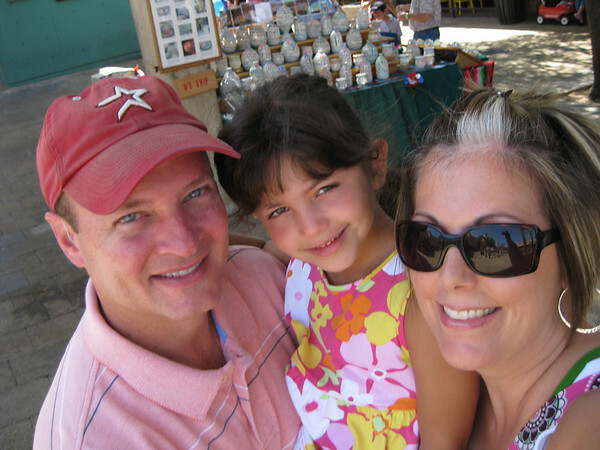 We plan to go back to San Antonio and use our Sea World pass (maybe even check out Fiesta Texas) when cooler temperatures and more clothing prevail. I know that's like saying, "When pigs fly!" since this is Texas after all, but at least over the Thanksgiving holidays the temperatures might be more bearable. *We did eventually brave the line and went into the Alamo. 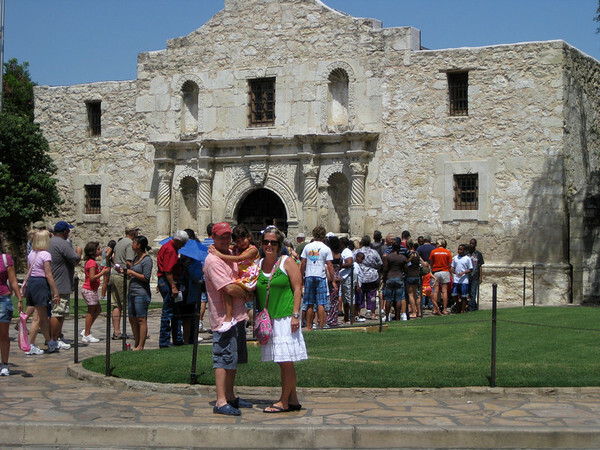 Once we were inside and saw the line of people snaking around the inside at a standstill, we decided to remember the Alamo at a later date. Amen to beauty of heavy hotel curtains and to having a no-real-plan-day as well. Apparently I need to read up on The Alamo because I've never heard of William B. Travis...gasp! 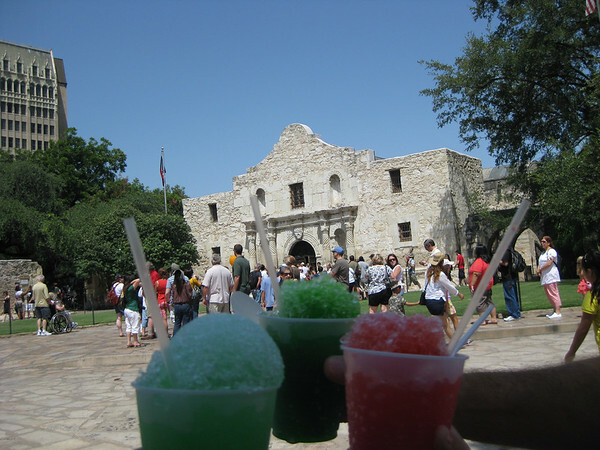 I think you guys are amazing stepping foot outdoors in such heat, so deciding to remember the Alamo later seems like a good idea. Hurray to only ONE day at SWorld, I mean I love SWorld too- but let's get serious here. 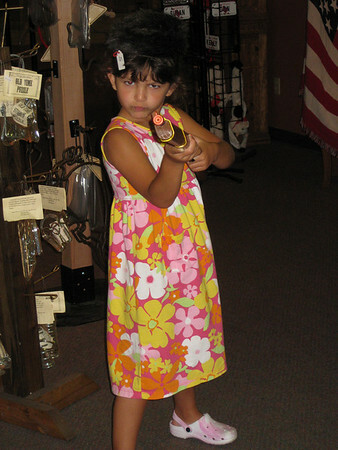 I am very impressed at you going at all- in the heat! I am stuck going from car/house & back in heat- I swear it makes me loony. And why is it that people with the least-desirable bodies are the ones showing so much skin? It's gross! sounds like a great "part 2!" glad you found a few ways to beat the heat... you know, other than letting body parts hang out!! HAHAHA! "way too many boomzooms..." I died laughing, Holly! I'm a fan of the light itinerary of a vacation, too. You've got have room for the spontaneous snowcone and nap in the afternoon back at the hotel. Sounds like a great family getaway! Oh, did I tell you how much I love the Vera Bradley purse? I remember the 1st time that I saw the Alamo I was surprised it was right there downtown and not out in the middle of Texas hill country as the post cards would have you think! William Barrett Travis was the leader of the Texas Regular Army (Jim Bowie led the volunteers) during the seige at the Alamo. Big ideas, bold words, tragic (foolish?) death = Texas hero. I know, the heat was so oppressive I'm pretty proud of our little old selves too just for leaving the hotel pool. 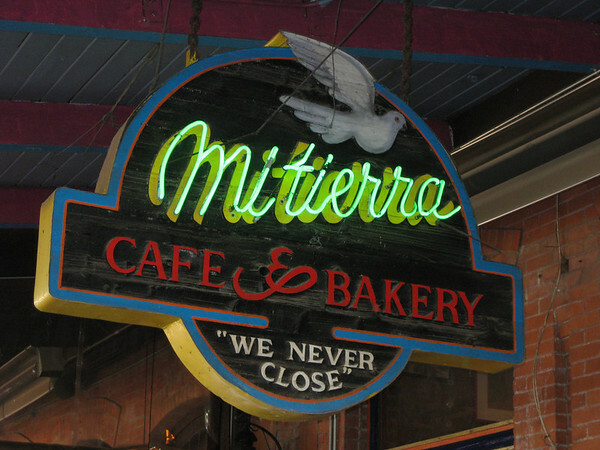 MiTierra is my fav place to eat TexMex. I love the market area too. The airconditioned part. Thanks for visiting SeaWorld and we look forward to you all coming back. We have a great Halloween and Christmas program, and those are great times to visit.....slightly cooler out too! Thanks Tim for your comment. We enjoyed Sea World and hope to return again in the fall.